RCBS makes some of the most rugged and durable reloading products you can buy. The RCBS Rock Chucker press is legendary — for good reason. The Editor uses one that has been in my family over twenty years. I also own an RCBS 2000 progressive press that has loaded many thousands of rounds, and features the excellent APS strip priming system. RCBS is serious about reloading, so this company has created a very complete series of instructional videos showing reloading precedures and equipment. You’ll find over 60 videos on the RCBS Video Resources Page and RCBS YouTube Channel. We encourage readers to check out the RCBS Videos. They can help you master the basics of handloading — case prep, priming, sizing, and bullet seating. In addition, these videos can help you select the right equipment for your loading bench. Videos show presses, case tumblers, ultrasonic cleaning machines, powered case prep centers, and more. Every novice hand-loader should watch this video. It covers the key safety principles you should follow, such as “Don’t use components of unknown origin”. We would add — always double check the labels on your powder bottles, and if you don’t know 100% what powder is in your powder measure — dump it out. Some of the most serious injuries have occurred when reloaders put pistol powder in rifle cases. This video address the common complaint some novices have when their hand-loadeed cartridges won’t chamber properly. Kent Sakamoto explains how to set up the sizing die properly to size the case body and bump the shoulder. Here Kent Sakamoto looks at the three main types of brass cleaning systems: Vibratory Tumbler, Wet Tumbler (with media), and Ultrasonic Cleaning Machine. Kent reviews the pros and cons of each system. Here are twelve more helpful videos from RCBS. These cover both reloading techniques and reloading equipment. There are currently over 60 videos on the RCBS YouTube Channel. Share the post "RCBS Reloading Videos — How to Load Better Ammo Safely"
There a number of good rebate programs going on right now, but many of them conclude at the end of the year. To take advantage of these deals you’ll need to start your shopping. Here are some current Rebate Programs for rifles, ammunition, loading equipment, and shooting accessories. You can save up to $175.00 with these Rebate offers. The savings can be huge. For example, you can save $175.00 on the purchase of any RCBS product costing more than $499.99. Share the post "End of Year Rebate Programs — Save BIG"
British competitive shooter Laurie Holland has reviewed three popular, single-stage reloading presses for Target Shooter Magazine (targetshooter.co.uk). Laurie bolted up a Forster Co-Ax, RCBS Rock Chucker Supreme, and RCBS Summit to his reloading bench and put the three presses through their paces. These three machines are very different in design and operation. The venerable Rock Chucker is a classic heavy, cast-iron “O”- type press that offers lots of leverage for tough jobs. The smaller RCBS Summit press is an innovative “upside-down” design with a large center column and open front. It offers a small footprint and easy case access from the front. The Co-Ax is unique in many respects — dies slide in and out of the upper section which allows them to “float”. The cartridge case is held in the lower section by spring-loaded jaws rather than a conventional shell-holder. If you are considering purchasing any one of these three presses, you should read Laurie’s article start to finish. He reviews the pros and cons of each press, after processing three different brands of brass on each machine. He discusses ergonomics, easy of use, press leverage, smoothness, priming function, and (most importantly), the ability to produce straight ammo with low run-out. The review includes interesting data on case-neck run-out (TIR) for RWS, Federal, and Norma 7x57mm brass. Share the post "Triple Threat — Laurie Holland Reviews Three Reloading Presses"
Graf & Sons is now offering various Burris scopes with Close-Out Pricing– up to $40% off. If you are looking for a budget-priced, medium-range zoom scope for your hunting or varmint rifle, check out these deals. For example, the Burris Predator Quest 4.5-14x42mm (Side Focus) Scope is now just $199.99 — that a 38% savings. In addition to these optics close-outs, Grafs.com is offering FREE Shipping for a limited time. You can get FREE Shipping with orders totalling $100.00 or more. This shipping deal is valid through 4/18/17 at 11:59 PM. Headed out for a varmint safari soon? Need inexpensive bullets for your .223 Rem or 22-250? Then check out this deal on from Midsouth Shooters Supply. Get 250 BTHP 62gr .224-Caliber bullets for just $24.99. That’s just $9.94 per hundred. At that price, it doesn’t hurt so much when you shoot 1000+ rounds over a weekend. With good expansion, these bullets work great on prairie dogs and other small critters. Note: These sale bullets ship in a bag. Midsouth also offers bulk pricing on 500-bullet and 1000-bullet quantities. Here’s the perfect weapon to repel boarders or fight zombies! OK, you may not really NEED a pistol-grip shotgun, but this thing is just so cool. The Mossburg 500 Mariner shotgun has a durable Marinecoat finish and comes in a Int’l Orange storage case that floats. Keep this pump-gun on your boat, in your truck, or make it part of your “bug-out kit”. The floating tube’s heavy-duty synthetic seal is factory-tested to be airtight and waterproof to 40 feet. With a 6-round capacity, this Mossberg shotgun features an 18.5″ cylinder-bore barrel with bead front sight. It even ships with a knife and a multi-tool. There is also a matte black version with a green tube for just $349.99. Walkie-Talkies are “must-have” items for long-range shooting. They let you reset targets and talk to back to the firing line. These are also very handy on hunts. The Motorola MH230R Two-Way Radio is Amazon’s #1 Best Seller in FRS/GMRS Handheld Radios. This under-$50.00 set offers 22 channels with a claimed range up to 23 miles (We’ve used them and they worked at 3 miles line of sight). The kit includes: 2 radios, 2 belt clips, 1 dual drop-in charger, 1 charging adapter, 2 NiMH rechargeable battery packs. Run-time is about 10 hours — plenty for a full day of shooting. There is also a newer version, the Motorola T260 for $58.99. Share the post "Bargain Finder 82: AccurateShooter’s Deals of the Week"
If you’re shopping for a heavy-duty, single-stage reloading press, there’s a new option you should consider. MEC, noted for its shotshell reloading machines, has just introduced an all-new, cast-iron press, the MEC Marksman press. This new single-stage press has features we really like. First, the beefy, cast-iron frame is strong enough for the toughest reloading jobs. Second, the MEC Marksman features an OPEN front — that smart design makes it easier to insert and remove cartridge cases during the reloading process. It also makes it much easier to place your bullets during the seating stage. This open-front design makes good sense — note that Hornady’s new LNL single-stage press also has an open-front layout for important reasons. Lastly the MEC Marksman has an innovative, self-centering shell-holder. This patent-pending design should help hand-loaders reload more efficiently. The MEC Marksman is made from ductile cast iron for superior quality and durability. 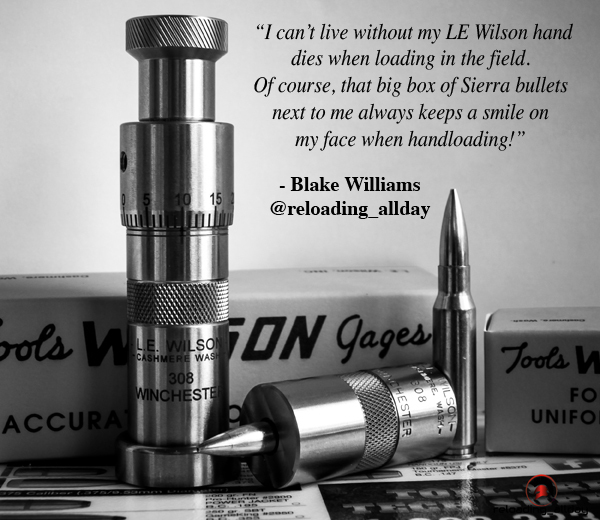 Our patent-pending self-centering shell holder provides greater accuracy and consistency to every reload. The MEC Marksman is compatible with all 7/8-14 thread dies to change calibers quickly. Reload .22 Hornet to .416 Rigby all with one convenient machine. The MEC Marksman single-stage metallic reloader and accessory products are made in the USA in Mayville, Wisconsin. In addition to the MEC Marksman, MEC’s new Metallic line of products will include reloading accessories. Powder measure, powder trickler, scale, and calipers will be offered. An additional base is available for easy installation and is compatible with the MEC Jig Fixture mounting system. Case prep tools and components are also available. 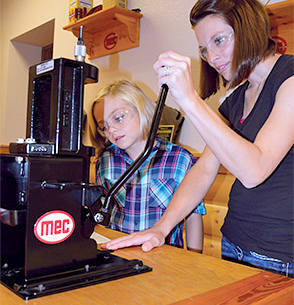 Share the post "New Cast-Iron, Single-Stage Marksman Press from MEC"